list price $<&<&id>_listprice> you save <&<&id>_salediscount>%! The number of American adults who didn’t finish high school is truly staggering. Some wish they could get a “second chance” by earning their high school equivalency credential, but many find the TASC exam too intimidating. They’re overwhelmed by the thought of having to learn or relearn school subjects by plodding through dry textbooks or sitting through tedious classes. Well, if any of this sounds familiar, you’re in luck! Now you can study with the TASC experts — on your schedule and at your pace. With over 30 years’ experience preparing students for high school equivalency exams, Video Aided Instruction has made getting that passing score easier than ever before. 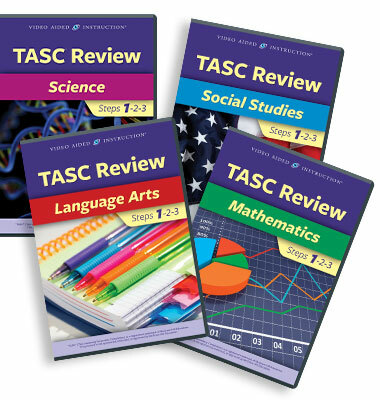 Our comprehensive TASC Review series is the ultimate resource for conquering the exam. Featuring real teaching by real teachers, these developmental study programs start with the basics, develop your skills, and take the stress out of learning. With this user-friendly DVD series, you’ll learn how to succeed on the Language Arts – Reading, Language Arts – Writing, Mathematics, Science, and Social Studies sections of the TASC exam! Each jam-packed review course begins with Step 1, where you’ll review basic literacy skills in reading, writing, math, science, and social studies (e.g., how to find the main idea of a reading passage; how to identify common sentence structure errors; how to work with fractions, decimals, and percents; how to use context to define unfamiliar scientific terms; and how to understand the causes and effects of historical events). Then, in Step 2, you’ll continue improving your abilities and build on what you’ve learned as you tackle more complex material (e.g., how to make inferences from a text; how to recognize when subjects and verbs don’t agree; how best to organize your ideas before writing an essay; how to solve quadratic equations; how to interpret scientific graphs; and how to make sense of political cartoons). And finally, in Step 3, you’ll tie everything together and learn the more advanced concepts you’ll likely be tested on (e.g., how to compare multiple reading passages; how to sound smart in your own writing; how to calculate volume and surface area of 3D solids; how to evaluate the results of scientific studies; and how to analyze historical documents). Along the way, you’ll work through a large variety of exercises so you can fill in any “gaps” in your knowledge and get extensive practice in the various subjects tested. Your easy-to-follow instructors reveal insider secrets about what the test-makers are looking for and proven strategies for answering every type of question you’re likely to encounter on your test. By the end of these programs, you’ll feel competent, comfortable, and confident when you walk into that exam room! NOTE: This invaluable series is a great investment for public libraries, schools, colleges, correctional facilities, etc. that wish to help strengthen America’s workforce and boost the economy! improve their skills, achieve their goals, & fulfill their dreams!